The Chapel of the Snows at McMurdo Station was destroyed by fire on 22 August 1978. No one was injured, but the chapel and almost all its contents were a total loss. The fire began in the rear heater room of the building about 5 a.m. The fire crew fought the blaze successfully in the interior of the chapel, but a sudden flare-up indicated that the fire had spread between the interior and exterior shells along the top of the building. The crew moved outside, but despite their efforts, the flames covered the entire chapel. To protect the communications cables strung near the front of the building, a bulldozer pushed in the front of the chapel. When the roof of Building 108, adjacent to the chapel, began to smolder, volunteers shoveled snow onto the roof and sides of the building to protect it from damage. A front-end loader finally knocked down the rest of the chapel and pushed the rubble away from the cables and Building 108. The bulldozer isolated still burning sections of the pile and dumped snow on them to keep sparks from flying in the breeze, By 7:40 a.m. the fire was under control. The Chapel of the Snows had not appeared in the 1956 plans for McMurdo Station. Religious services were to be held in the mess hall. Admiral George Dufek reported, "As the construction of the buildings at McMurdo progressed, a mysterious pile of limber, planks, nails, Quonset hut sections, and assorted materials began to accumulate on a knoll overlooking the camp." Father John C. Condit, the chaplain, and Seabee volunteers took these odds and ends and built the nondenominational chapel on their own time, after they bad finished their daily work on the station buildings. Dufek wrote, "Before the main camp was finished a tidy neat church with a steeple was to stand on a ridge overlooking the camp. Later it even had a bell, procured from a small gasoline tanker." Some small religious items, all damaged, along with the chapel bell were recovered from the rubble, Otherwise the building and all its contents, including historic memorabilia from Deep Freeze One and subsequent winter crews, were a total loss. McMurdo Station once again has a permanent place of worship. 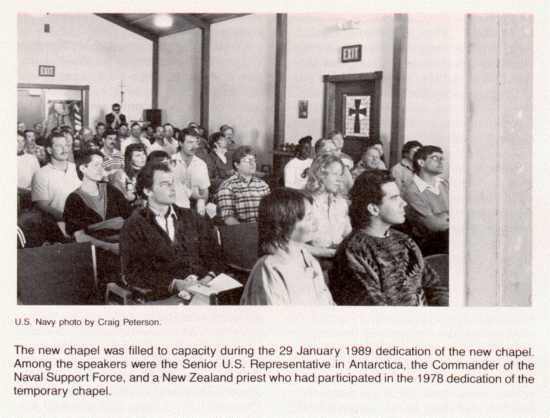 To commemorate this occasion, approximately 80 people gathered on Sunday, 29 January 1989 to dedicate the new Chapel of the Snows, which is the third chapel to be raised at the station. Just 840 miles from the South Pole, the Chapel of the Snows is the world's southernmost building erected primarily for religious services. It also is the only known house of worship in Antarctica. Situated on a knoll overlooking McMurdo Sound and the peaks and glaciers of the Transantarctic Mountains, the new chapel replaces the temporary building, a makeshift hut, that has been used for religious services and related activities for 11 years. The hour-long dedication ceremony attracted an overflow crowd from McMurdo Station and Scott Base, the nearby research station operated by New Zealand. The service included piano music, hymns, and readings from the Bible. Lt. M. Brad Yorton, chaplain of the U.S. Navy's Naval Support Force Antarctica, whose support includes religious services at the station, presided. Also participating in the ceremony were Ronald R. La Count, the senior U. S. representative in Antarctica at the time of the dedication; Captain Dwight Fisher and Commander John V. Smith, the commanding officers of the Naval Support Force Antarctica (NSFA) and the Antarctic Development Squadron Six (VXE-6); Neal Terry, personnel coordinator for ITT/ Antarctic Services, Inc, (NSF's support contractor); and guest speaker Father Gerard Creagh from Hoon Hay Parish in Christchurch, New Zealand. Mr. La Count described for the group the construction of the new chapel and recalled how volunteers had erected the station's earlier Chapels in their space time. He also cited official reports that documented over the years the significance of worship for those at the station, whose work took them far from their families and their home communities. This service marked the second time that Father Creagh had participated in a ceremony to dedicate a site for religious services at McMurdo Station, as he was the invited speaker in 1979 when the community gathered for a similar service recognizing the makeshift chapel that has been replaced by the new structure. In his address he praised those who built the chapel in just 4 months. "The result is truly deserving of the accolade found in the twenty-first chapter of the Book of Revelation: 'This is God's dwelling among people.'" Continuing, he noted that "Another chapter in the history of a unique operation is about to begin-a unique operation in peaceful cooperation and coexistence on the only continent that has no weapons, has known no class struggles or wars, and from which nuclear explosions and waste are banned by treaty." In preparation for Antarctic research to be conducted during the International Geophysical Year (1957-1958), U.S. 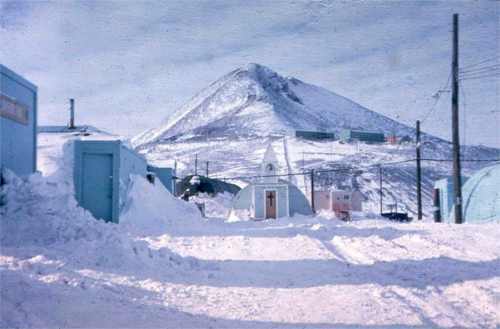 Naval Construction Battalion personnel (Seabees) began building McMurdo Station during the 1955-1956 austral summer. The original plans for the station did not include a chapel; instead, religious services were to be held in the station mess hall. However, according Admiral George Dufek, who commanded Deep Freeze I, "As the construction of the buildings at McMurdo progressed a mysterious pile of lumber, planks, nails, Quonset hut sections, and assorted materials began to accumulate on a knoll overlooking the camp." The Chaplain, Father John C. Condit, and volunteers from the construction battalion gradually gathered enough materials to build what was to become the first church ever erected in Antarctica. All of the work was done by volunteers after their daily duties were finished. Admiral Dufek also observed that "The men, after a hard day's work, would drift over to the church site. Before the main camp was finished a tidy neat church with a steeple was to stand on a ridge overlooking the camp. Later it even had a bell, procured from a small gasoline tanker." When the Chapel of the Snows was completed, Father Condit had the world's most southern parish. For 22 years this simple building provided a place of worship for personnel not only at McMurdo Station but also from nearby Scott Base. On 22 August 1978 at about 5 a.m., a fire, believed to have begun in one of the buildings heaters, broke out. At first the firefighting crew thought that they had controlled [the] blaze, but a sudden flare-up suggested to them that the fire had spread between the interior and exterior shells along the top of the building. Despite their efforts, fire soon engulfed the structure. Fearing that the fire would spread to the adjacent structure, Building 108, or destroy the communications cables strung between poles near the front of the chapel, the crew brought a bulldozer to the building and pushed in its front. Soon, however they noticed the roof of building 108 was smoldering. With the bulldozer, they isolated sections that were still burning; snow was dumped [on] these sections and the smoldering roof of the other building. By 7:40 a.m. the fire was under control, but the chapel was destroyed. Only a few religious objects and the chapel bell were recovered. To replace the chapel, volunteers converted a quonset hut near the station's main building. While they worked to complete this temporary chapel, the Chalet served as the site for the community's religious services. However, this building, which normally houses NSF and contractor offices, could not accommodate both Sunday morning services and daily administrative activities during the summer season. On Easter Sunday 1979, the temporary chapel was dedicated. 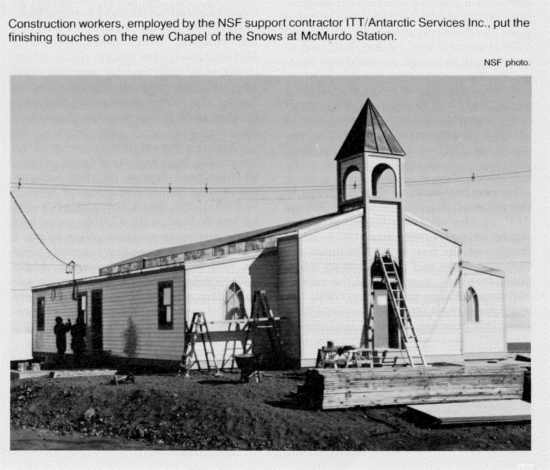 Although the original chapel and the temporary building were built entirely by volunteers, the new building was constructed as part of the National Science Foundation's plan to refurbish the McMurdo Station. The 2,016-square-foot wood structure contains office space, a central worship area that normally seats 63, and McMurdo's only organ. Materials to complete the building were salvaged from older structures that were ripped down during the several-year rebuilding of the station. As a postscript, note that the temporary chapel, in use as such after the 1978 fire until the new building was dedicated in 1989, was a Quonset hut next to Building 155. On 18 May 1991 during a Condition 1 storm, it caught fire and was totally destroyed. Since the new permanent chapel had been dedicated in 1959 the structure had been used as a band practice area and for storage of musical instruments. A station band was playing at one of the clubs that night, so there was little loss of contents. The firefighters struggled to keep the fire from spreading to 155 by spraying the side of that building to create an ice wall, and several of them caught frostbite during the effort. After about 5 hours of firefighting, it was extinguished by dumping loads of snow on the remains of the building.